The front 9 holes are a mountain course layout with ups & downs and each hole is separated by trees. On the other hand, the back 9 holes are flat with water coming into play on many holes. 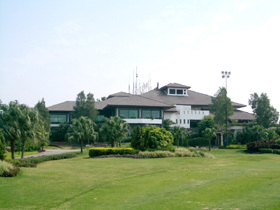 Overall, the course is designed to make use of the natural terrain. It also features attractive par 5s. A tricky but unique par 5 layout. The tee shot is greatly downhill and it doglegs 90 degrees to the left 300 yards from the tee. The landing area from the tee as well as the second shot is very narrow. If you curve your shot left or right, it will easily be OB or get caught in a hazard. The third shot is intimidating, too, because the relatively small green is mostly surrounded by a dry creek. One way of attacking the hole for a pro is to use a long iron off the aiming to the right side of the wider fairway because a driver makes the landing area extremely narrow. Then, to make a short cut he would hit over the tall trees on the left side of the fairway by using a fairway wood. This is a very bold attacking route. Beginners and medium-level players should not try this route and even many advanced players whilst technically able may fail to execute on this hole due to the stress factor. 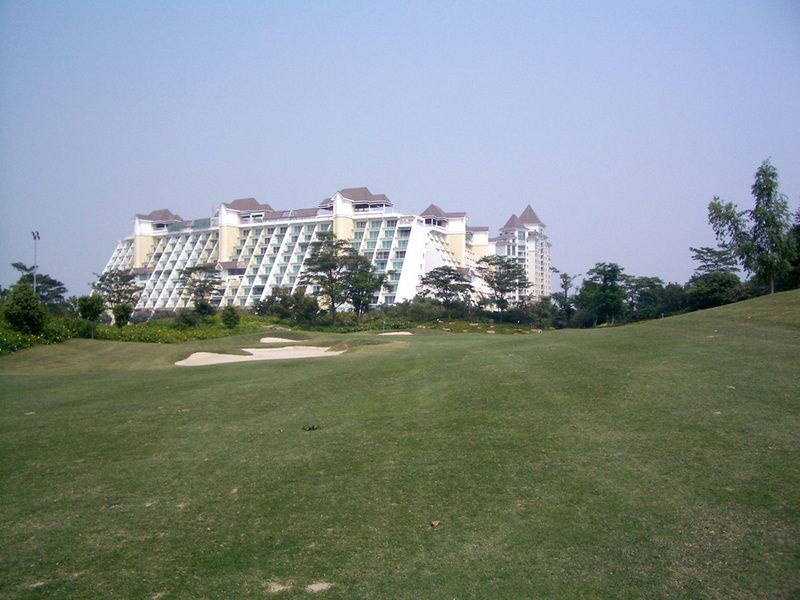 The tee is the highest point on the course with panoramic views of the front 9 and the outlying property. A dogleg to the right and a sharp uphill. Bunkers on the corner of the dogleg from the tee shot and bunkers in the middle of fairway on the second shot come into play. The approach shot requires a hit to an elevated green whose left is protected by very deep bunkers. You should drive to the right of the fairway bunkers because a creek runs along the left. The second shot is over the creek and the third shot needs to be hit accurately because the creek even cuts into the right side of the green. A beautiful par 3 with a lot of the natural flavors. The wide green protrudes like a peninsuala to the left toward a lake , so the entire front, left and backsides of the green face water hazards. A dogleg to the left, a gentle uphill. A beautiful lake with a pretty small waterfall on the left are well positioned to swallow an inaccurate shot. Also be careful of a bunker in front of the green. It takes one and half hours from Hong Kong by a club car. The car is better and more comfortable than a bus because you can shorten the trevel time through immigration. I played with a single-handicap member from the black tees or tournament tees, which should be possible to play on weekdays. It seems that playing from the black tees is not allowed on weekends. The black tees actually had no tees on the grounds, so we played from back tee box next to the yardage makers. Playing from the black tees, it is a very demanding and difficult course. 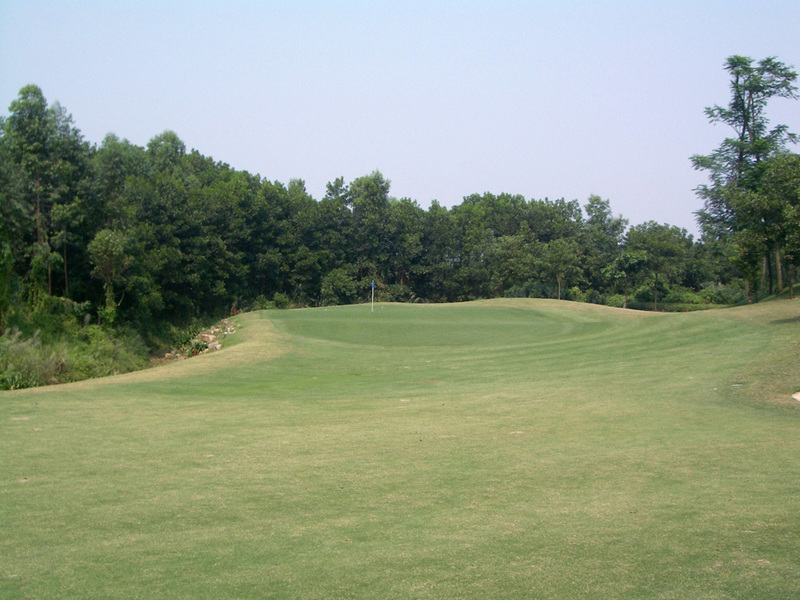 When advanced players play from the blue tees of 6100 yards, 900 yards shorter, they are not only misled into thinking that the course is easy but also tend to become bored because the hazards in proper positions such as bunkers or lakes don’t come into play so much. There are yellow tees between black and blues tees, so the medium & advanced players understand the course better if they use at least the yellow tees.